It was a return to what was done in North Georgia: strike the railroad and take out bridges and blockhouses in an attempt to isolate the nearly 8,000-man Murfreesboro garrison under Gen. Lovell Rousseau and prevent reinforcements from arriving from Chattanooga. Bate moved his command cross country and arrived at the Murfreesboro Turnpike near Overall’s creek about five-and-a-half miles north of Murfreesboro to strike the Nashville and Chattanooga Railroad. Bate confronted a blockhouse there, sending part of his Florida Brigade under Col. Robert Bullock and the 5th Company Washington Artillery to deal with it. However, the garrison put up a spirted defense, and the arrival of troops from Murfreesboro foiled the attempt and drove off the Floridians after wounding Bullock. Bate withdrew and was soon joined by Forrest with two cavalry divisions and two more infantry brigades. Forrest took command of the whole force. Forrest decided to move the force against Murfreesboro itself, but realizing that the town—guarded by the massive Fortress Rosecrans—was impregnable, he decided to attempt to lure a force out of the fortifications and deliver a crushing blow to them in a more open area. Bate’s infantry was to be the bait. Bate moved toward Fortress Rosecrans on December 6, engaging the Union picket line and digging rifle pits and entrenching his main line. That evening, orders were received from Forrest to withdraw further to the west at daylight. Bate ordered his men back at dawn. They made their way back to a hill at the intersection of Wilkinson and Salem Pikes near Overalls Creek. There, Bate joined with Palmer’s Tennessee Brigade and Sears’ Mississippi Brigades . Word then arrived that Union troops were approaching from the south. 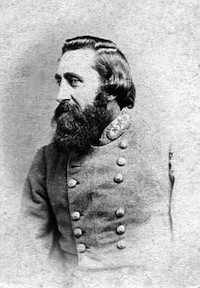 Gen. Robert Milroy, in command of two infantry brigades, had been sent to engage the Confederates. Forrest now ordered the infantry to build temporary works and face this threat. Fighting soon began as Milroy’s two brigades emerged from a cedar forest and advanced into a cornfield in front of the Confederate position. After a short while, Milroy ordered his men to withdraw. Once under cover of the forest, he ordered them to move around the Confederate left and form on their unsuspecting flank. Late in the afternoon, Milroy ordered his force forward. Forrest, hearing the opening of the attack, ordered Bate to shift his forces to confront the new threat, but it was too late for Bate’s men. Milroy’s troops smashed into the lines, sending them reeling. Finley’s Floridians stampeded from the field as the rest of the Confederate line collapsed. One witness noted, that Forrest, “Finding his pleadings did not accomplish anything—threw the flag to one of them—saying take the damned dirty rag & go to the rear!” Another account has Forrest throwing the flag on the ground in his rage. Either way it was an ugly scene for all those present. Thus ended a very ugly episode. 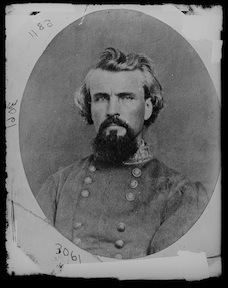 This entry was posted in Battles, Western Theater and tagged Battle of the Cedars, Murfreesboro, Nathan Bedford Forrest, Robert Bullock, Robert Milroy, Washington Artillery, William Bate. Bookmark the permalink. Thanks for the interesting article !!!! I read that Forrest actually shot the retreating color bearer down,or so said W. A. Galloway of the Columbus (Georgia) Artillery, an eye witness. Don’t know how true the comment is, but Forrest wasn’t exactly a reasonable person, so I wouldn’t put it past him..